Thattekkad Bird Sanctuary is located in Ernakulam district on the banks of the River Periyar. It lies at a height of 525 m above sea level and covers an area of 25 sq kms. 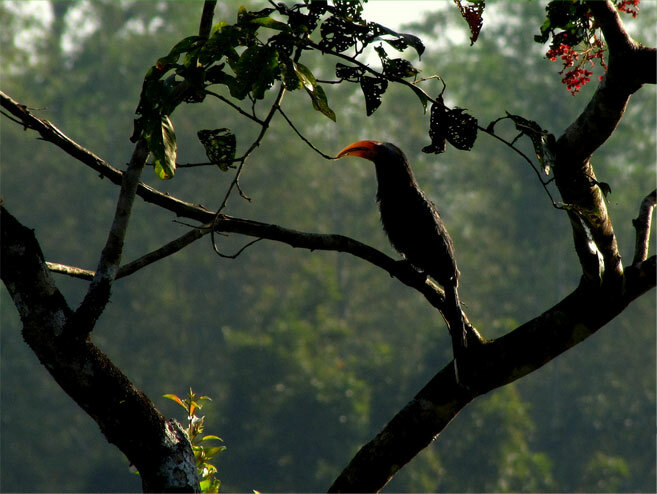 This sanctuary established in the year 1983 is the first recognized bird sanctuary in Kerala. It was set up by Dr. Salim Ali who was an ornithologist. So this sanctuary is also called as Salim Ali bird sanctuary. The total area of this sanctuary is around 128 sq kms. There are a wide variety of local as well as migratory birds in this sanctuary. The vegetation types found here are dense tropical evergreen forest and deciduous forests together with some grassland. Trees such as teak, rosewood etc. are grown in plenty. The birds such as bee-eater, strike, Grey Heron etc are the rare birds seen, while woodpecker, sparrow, myna etc are some of the commonly seen birds of this sanctuary. Besides birds, there are some animals as well such as Elephants, leaopards, snakes etc. The best time to visit this sanctuary is during the months September to June. Tourists who are bird watchers can take a ride on the elephant to watch the birds.